Hybrid Power Solutions market size in 2017 was valued over USD 8 Billion and is set to exceed the cumulative capacity of 9 GW by 2024. Surging electricity demand across remote off-grid areas along with increasing need for continuous and reliable power supply will drive the hybrid power solutions market size. Alarming concerns toward inefficient grid infrastructure coupled with disparity in demand supply primarily across developing economies will amplify the industry growth. As per IEA, in 2017, the global electricity demand has witnessed 3.1% rise when compared to 2016, led by Asia Pacific region. Favourable norms including feed-in-tariffs, leverage schemes and subsidies to promote the adoption of clean energy technologies will augment the hybrid power solution market growth. In 2010, Government of India had announced a subsidy of USD 1,450 per kW to encourage the installation of these systems. As per the incentive, community users must use 10% of annual budget for R&D purpose. Growing focus toward the decentralization of power generation coupled with the rising demand for eco-friendly technologies will positively impact the market. Increasing investments from various financial institutions including regional development banks and International Finance Corporation (IFC) will further the stimulate the industry landscape. In 2017, National Development & Reform Commission along with National Energy Administration of China announced the market-oriented initiative pertaining to distributed power generation. Augmentation of capacity utilization factor owing to the introduction of innovative technologies for renewable systems is anticipated to expand the standalone hybrid power solutions market. Furthermore, ability to provide power for peak load with the adoption of efficient, low cost and smart technologies will also impact the industry outlook. On grid product segment is projected to grow on account of increasing demand for backup power supply along with offsetting utility bills. High capacity generation, effective capacity utilization factor, ease of installation and grid stabilization potential are the key parameters that will stimulate the industry growth. Solar wind market is projected to grow exponentially owing to the growing focus towards the supply of reliable and sustainable power for commercial and residential applications. Introduction of innovative, cost efficient and reasonable technologies will positively impact the industry outlook. Alarming prices of petroleum products coupled with increasing demand for low emission technologies will further strengthen the technology demand. Residential hybrid power solution market size is anticipated to witness robust growth due to several ongoing electrification programs across developing economies. In 2015, the government of China has introduced a wind solar hybrid system, with an overall capacity of 300 MW with an aim to supply effective power to 2000 residents across the region. Commercial segment is projected to grow over 8% by 2024. Growing investments toward the installation of low-emission sustainable systems to overcome the electricity demand with the adoption of commercially viable technology will stimulate the industry growth. In 2014, Suzlon inaugurated its first commercial hybrid solar wind power plant in India with an overall generation capacity of 2.1 MW. 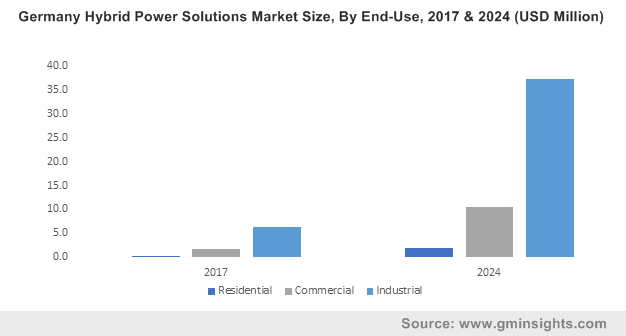 Increasing adoption of sustainable systems along with growing awareness toward the adoption of standalone systems across residential establishments will propel U.S. hybrid power solutions market growth. Growing demand of uninterrupted power supply coupled with rapid technological advancements and industrialization will stimulate the industry outlook. In 2016, Enel Green Power brought together three different renewable technologies (geothermal, solar thermal & photovoltaic solar) in one single plant at Stillwater. Abounding availability of solar and wind energy coupled with introduction of government policies to promote the adoption of sustainable technologies will boost the Indian market. In 2018, the Ministry of New and Renewable Energy (MNRE) has announced National Wind-Solar Hybrid Policy to promote large grid-connected wind-solar power generation systems for efficient utilization of transmission infrastructure. 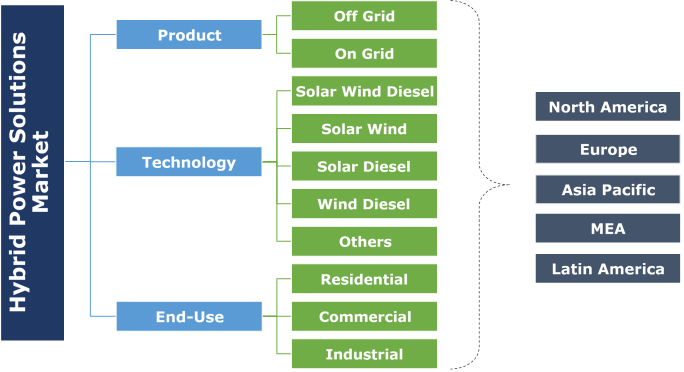 Eminent players in hybrid power solutions market include General Electric, Wartsila, Gamesa, VONK, Polar Power, Vestas, Danvest, BWSC, Grupo Dragon, FlexGen, Sterling & Wilson, Blue Pacific Solar, A123 systems, Zenith Power Systems, Alpha Windmills, Windlab, Unitron Energy, Tesla and Star Sight. Major players across the industry are concentrating on emerging innovations regarding sustainable energy to generate power on a large scale and acquiring huge projects in collaborations with other companies as one of their strategic moves. Hybrid power solutions comprises of combination of one or more sources in integration with conventional generation assets (solar wind or solar diesel) to generate electricity and power. The system provides a very high level of energy security by mixing various generation methods, and usually deploys a storage system (battery, fuel cell). It can minimize power loss when transferring over long distances by converting AC power to higher voltages. Hybrid power solutions range in size from comparatively large island grids to individual household power supplies and are commercially viable & sustainable.